eyes that reflect the real you. 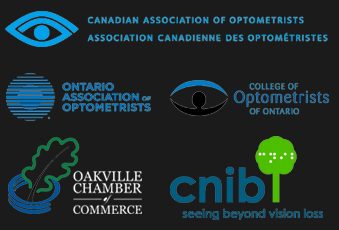 Our Oakville based optometrists are dedicated to providing you with highly personalized care, top-notch customer service while using the latest technologies to ensure your vision needs are well taken care of. As a full scope Optometry clinic, we also carry a huge selection of eyewear; including glasses, sunglasses and contact lenses at our Oakville based location. Come to visit us today! C0-management from your eye doctor in Oakville. Discover all the amazing technology we use to ensure your eye health. We carry an incredibly wide selection of designer eyewear at Bronte Optometry, including top brands such as Ray-Ban, DKNY, Guess, Marc Jacobs, Vera Wang, Polo Ralph Lauren, Spy, and many more. We offer professional fit contact lenses for patients of all ages at Bronte Optometry in Oakville. Our experienced Oakville Optometrists are highly trained professionals with over 50 years of experience providing care to patients in the Oakville area. Our doctors have joined forces at Bronte Optometry to help their patients experience the life-changing benefits of healthy vision and world-class eyewear or contact lenses. Dr. Nell Van Ymeren – Dr. Van Ymeren received her Bachelor of Science at the University of Waterloo and completed her Doctorate of Optometry in 1976 from the University of Waterloo School of Optometry.